Nestling in a green valley in the heart of the Shropshire countryside is Stokesay Castle. This is one of England's best preserved fortified manor houses. 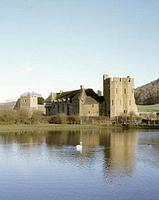 Stokesay's Great Hall is unchanged since the days of baronial feasts, and the house has hardly altered since 1291. There is a superb timber-framed Jacobean gatehouse to see, and a moat walk around the Castle, along with a shop and tearoom. 7 miles NW of Ludlow off A49. Craven Arms Station 1 mile.